Republican state lawmaker faces former governor/senator Bob Kerrey in the fall to fill seat being vacated by Sen. Ben Nelson. State Sen. Deb Fischer, center, with credit union representatives at a meet-and-greet last week. 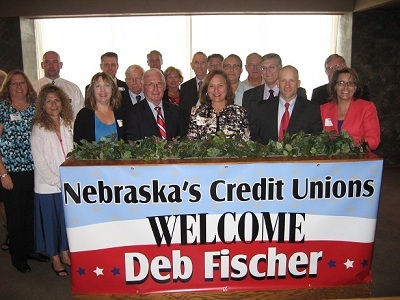 The Nebraska Credit Union League hosted a meet and greet event last week with Republican U.S. Senate candidate Deb Fischer.